The Bullets are here – better late than never! Round 14 was in stark contrast to 13, and I’m liking it. In this week’s edition, I release my Makers and Breakers, and try to answer some of the big questions facing fantasy coaches this week, such as Overall or League, what to do with Sandi, and who the perfect Upgrades are! That’s better! After the carnage that was dished up last week, we got a quick reprieve, thanks to a massive head start on Friday night which continued for the most part over the weekend. Round 14 had it all – late withdrawals, injury comebacks, new injuries, raised ceilings and possibly a donut, which meant mixed fortunes for fantasy coaches. There comes a time in every coach’s life when… they need to reconsider their goals. Sometimes, a mixture of form, bad luck, terrible timing and a few sudden injuries can put your team through a horrid patch. When this happens, (which it probably already has, unless you are one lucky guy) you have a choice to make. Do you continue to fight for Overall position (knowing the FJ will never be parked in your driveway), or do you cut your losses and concentrate on Leagues? I had this decision to make last week. I was drifting out of the top few thousand, and with a few short term injuries, was it really worth trading to cover them? I decided that a bit of pain over the next few weeks is better than an entire off-season of regret, and I chose Leagues. So I tanked with Zmith’s donut, and I got what I deserved – a score in the 1700’s. But, as someone famous once said, ‘a week is a long time in Football’. After a bit of luck, I managed almost 2200 this week, and I actually improved in the rankings. Now I have to make the same decision all over again. With only a few upgrades remaining in my team, I’ve been reconsidering the merits of some of the most important trading criteria. At this stage of the year, what is more important – getting players at basement price, or getting them after their 2nd bye? Now, I’m not going to go into the pros and cons of each, because we already know these. But ultimately I answered my own question with another question – why can’t we do both? Here are a few players on my radar that will be close enough to basement price at just the right time. He has a bye in the Round 16 MBR, after which he should still be at an incredibly low price of 320k or less, assuming he scores around 100 this week. Most people hopped on him for $317 last week, but he’ll be making his way into my team after Round 16. He’s just had his bye, so now is the perfect time to pick him up – in form, and at the lowest price he’ll be for the foreseeable. At $360k, and given he hasn’t score under 80 in his last 7 with no byes left, he’s great value. If you’re looking to upgrade in your mids, wait two more weeks and you can pick up Scott Thompson at $400k without a bye to come. He’s scoring fantastically at the moment – imagine if Adelaide became competitive towards season’s end? There are more out there, it just takes a little bit of effort to find them. What’s the 411 on 211? He’s out for a month. Now rewind 3 weeks. Sandilands was injured and it was revealed to be his big toe. Coaches around the nation breathe a sigh of relief, and decide to relegate him to the bench for a month – after all, it’s only a badly stubbed toe, it won’t affect him long-term. Now fast-forward back to the present. He’s out for another month! After holding him for all that time, passing up all that cash which would have come in very handy, and copping a donut in Zmith’s bye, I’m forced to finally trade him. And now Cox has the bye, so I have to trade him to someone who will actually play! (Mitchell Curnow at $80,400 was a serious option for me) And what’s worse, he only scored 47 and depreciated $31k. Great Sandi. Thanks a lot. Our saviour looks to be Matthew Lobbe. There was a lot of talk about him pre-season, mostly as a DPP with Petrie, but then he got injured and exited calculations. He played his first game this week and scored 95, and even though he’s priced at $126k, he’s worth it. He’ll cover Cox’s donut this week and hopefully hold his spot in Port’s fluctuating side to function as decent bench cover. But seriously Sandi, if it’s such a problem cut it off. It worked for Daniel Chick. As I alluded to earlier, Friday night was a massive scoring affair, with 12 players to top the ton. Of these, 9 wore Hawthorn colours. Many themes, or patterns, in Dreamteam are often fleeting, but the concept that the Hawks are fantasy sluts is here to stay! Of the top 14 scores this round, half of them were by a Hawthorn player. Or put another way, 7 Hawks players scored 124 or above. Huge! That’s why the Hawthorn FC gets my top spot. A special mention goes to Isaac Smith, who top-scored with 138 in his 4th AFL game. Enright started Sunday’s match against Adelaide possessed, with 101 to half time. He slowed down a touch, but still pumped out a massive 153 points. It wasn’t an amazing performance, with most of his possessions uncontested or gifted (or may as well have been, Adelaide’s pressure was non-existent), but this is DT, we don’t care about accolades, we just want the points. Last week, smarty_mc asked me about Cloke as a fantasy option, and after a sneaky look over his assistant coach profile, he was well and truly on my radar. But with his 6 goals and 136 DT points, his price shot up $39k, and I’m kicking myself for not being able to predict the future. His average over the last 3 rounds is 124.7, and with a BE of 32 and the lack of decent forward upgrade targets, he is shaping as one of the better options. Scotland is an overdue addition to the Makers, and that’s exactly why he’s there this week. He rarely scores huge (this week’s 123 is his season-high), but he is one of the most consistent performers in the game, up there with Rischitelli. He averages a shade over 100, but his lowest score in the last 12 rounds is 91. That’s exactly what you want from a guy – consistency, and the satisfaction of knowing you’re going to get exactly what you paid for. I’m not a massive fan of Carlton’s bye in DT finals so I won’t consider him, but if it doesn’t bother you, he’s a no-brainer as your next backline upgrade. Griffen is another player that flies under the radar, averaging 102 for the year and scoring 126 in Round 14. Usually, I’m loathe to awarding a position in the Makers to a player who came up against the Suns, but Griffen has been in great form and deserves a little recognition. He has only scored under 100 three times this year, yet he’s priced under $370k! If you have a spot free in your mids, consider him. Unlike last week, I don’t think I could pull together a whole team of Breakers for Round 14, let alone 5 guys who really deserved it. So I’ll keep this to honourable mentions. Bartel and Mzungu being late withdrawals created a few donuts, while admittedly for some paved way for I.Smith to take to the field. I’ve already mentioned Sandi, but he should probably cop a mention here for losing me my match against Team FLOSSY. After all the faith I put in him… Judd is another player who was well below his usual output this week, collecting only 17 touches against his old club. He finished with 76, which isn’t terrible, and shows how much I’m struggling to find anyone who really should be branded a ‘Breaker’. Wait – Knights. He would be feeling the scorn of my words right about now if he wasn’t such a junk time King, but to only have 22 to 3QT is unforgivable. You’ll be out of my team before long buddy. West Coast undertakes their 2nd bye this week, which means Cox and Darling needs to be moved to the bench asap. Just a reminder – Gold Coast, Collingwood, St. Kilda and soon the West Coast are the only teams to complete their 2nd bye, so make sure you consider trades accordingly. Tip of the week – go unique. It could be the difference. Follow me on @tbetta9 on Twitter for the latest. Thoughts about getting jack watts in? Don’t listen to these jerks, Watts is looking really good atm. Worth a punt instead of the sheep option of Sylvio. You seem to know what ur talking about. Should I upgrade Lower to Newman Harris/Hibberd to Pendles or Darling to Cloke ROK etc?? Stand clear of Newman, Hibberd-Pendles (unless harris doesnt return this week) and Darling-Cloke would be good trades. i picked up Cloke a month ago and hes been awesome , had his byes and his finally got the confidence to reach his potential, unique too. How many players do people have out in multi-bye rnd 16. I have 5 but only 2 in the best 22.
im with ya mate have exactly the same outs as you. When 1 of my mates rang me and said that Enright was on 101 at half time I honestly thought he was lying. Really happy with my team and it is settled… however was going to go with a 6 premo back line..just to keep some trades up my sleeve…however i really would like to finish it off with Fisher (but only have 7 trades left, and i would need to do a downgrade/upgrade to get him in). What do you reckon.. is it worth it or should i save the trade…especially with Lower v the Suns this week? Id hold the trades mate. Your seventh back/s are all reasonable. So im assuming your mids and forwards are complete? I have gone the discount ruck theory alll year and it has kept me in the top 5k so pretty happy…even more so seeing Sandi go down. L Berger and Z Smith with Hale and a no gamer (Curnow from Port). Stupidly traded Petrie early on which is why i had Hale.. might work out ok with Hale no looking like getting a regular game. Brilliant team mate, what’s your ranking? who are your other premo mids? First year Dteamer and need some help with any trades i should be doing. I have 11 trades left, 200k in the bank and my mids are complete. who to get in and who to get out! Help plzz!! back line needs some work.. would look at bringing in Fisher/Shaw and one of the Hawk boys Suckling/Birchall..see which cows have fattened the most to trade but thinking otten and toy. Agreed but I’d trade Otten, Poo & Thompson (Toy’s worth FA) and get in Suckling, Fisher and a rookie defender. Hey guys, I have 5 trades left and 23k in the bank. should I trade Sandi > Lobbe then B.Smith > Suckling and hold my last 3 trades or just go Sandi > Goldstein and hold my last 4 trades? of course with my above trade options I could wait a week or two as Goldstein has a high B/E of 144 and before Lobbe rises in price. i need help with my midfield. 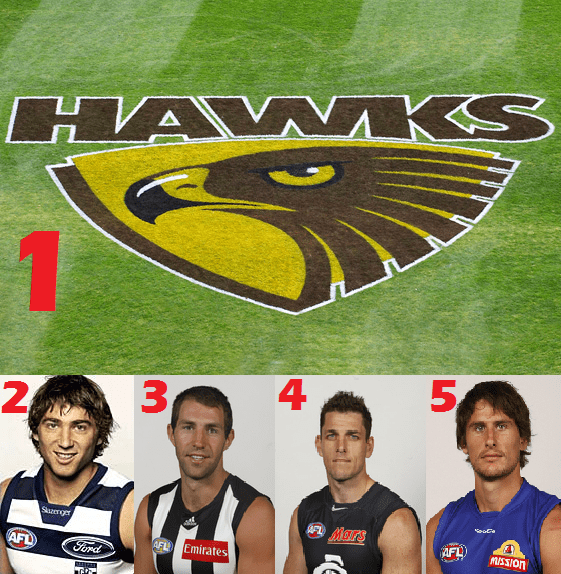 i can’t choose between D. Swallow or I. Smith from hawks, who do u reckon i should put? thinking for either riewoldt or bartel.